We always look forward to celebrating BWS day. It’s been a special day that we have set aside as a day to celebrate Jake and make him feel special in spite of his differences. Our hope is that it helps us shed a positive light on his syndrome. The first year, we had an amazing friend who put together a BWS Walk around a local park. The second year, we organized a BWS group at the local Bubble Run 5K to help raise money for the local children's hospital. Last year we threw a fun BWS party with his friends! Everyone wore YELLOW for childhood cancer awareness and the house was decorated in yellow and green. We had yellow balloons, banners, streamers, and even yellow and green themed snacks! But this year BWS day snuck up rather quickly with the birth of our second child just a few weeks ago. So if you are strapped for time like me, and need a quick and fun way to throw together a BWS day…here are a few fun ideas. I saw this idea on Pinterest awhile back and thought they would make a cute BWS themed snack. I purchased the sandwich sized ziplock bags and filled one side with 1/4 cup of goldfish and the other side with halved green grapes. Then placed a clothespin in the middle. Viola! A simple and fun BWS day snack! Jake had so much fun finding yellow themed items at the local dollar store and Party City. He chose yellow bubbles, balloons, gold necklaces, chocolate gold coins, yellow lollipops, and added one of the BWS Awareness bracelets. We then placed all the items in a ziplock bag and stapled a yellow tag at the top with a special note from Jake. He brought these bags to school and passed them out to his classmates. FREE PRINTABLE DOWNLOAD: If you would like to download and print the BWS Tags click here. Feel free to edit and personalize the tag. We printed ours on yellow cardstock. Every year we invite friends, family, co-workers and classmates to wear YELLOW and GREEN for BWS. We pass out BWS Awareness bracelets and take photos! It's a fun way to get everyone involved and raise awareness. FREE PRINTABLE DOWNLOAD: Click here for the flyer his teacher passed out at school. Please feel free to download and personalize. We have so much fun making a BWS shirt every year. We buy a cheap yellow shirt (I've had the best luck finding one at Walmart and Hobby Lobby) and iron on a fun saying. His shirt last year read "I'm BIG and I know it!". We purchased the iron-on letters to make the shirt. This year we originally purchased those adorable gray shirts from Kim. We absolutely LOVE them, but his school was doing a yellow-themed party for him so I needed a yellow shirt and I of course waited until the last minute to find one. So instead of scouring the stores for a cute yellow shirt, we created the design online, and then printed it on iron-on transfer sheets. You can use Microsoft Word, Canva.com (which is a free website where you can create a design, but they will ask you to pay for certain images/fonts and to remove the watermark). 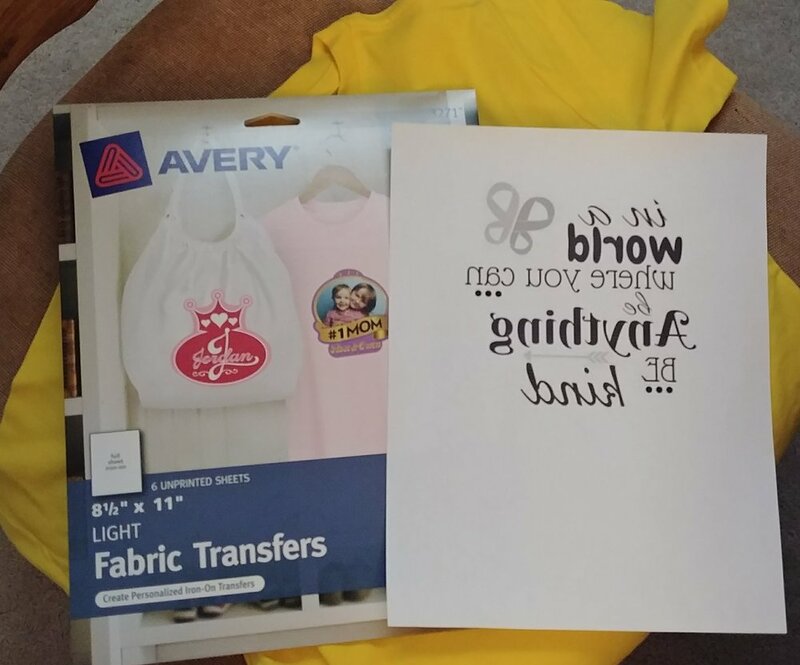 I purchased the Avery brand iron-on transfer sheets and used the Avery.com website to create a free design. Just make sure you use an ink jet printer! I tried to use our laser printer and the iron-on paper melted to our printer...oops! But luckily we have an amazing neighbor who let us print the design and it turned out so cute! FREE Printable Download: Click here for a PDF file of the design. Feel free to download it and print it onto an iron-on transfer sheet to make your own BWS shirt. What are your fun ideas for celebrating BWS day?